To make your house into a home that you and your family can truly enjoy, you need to make it a comfortable and safe place to be. Professional landscape artists are able to assess your backyard and develop a plan incorporating your design ideas. Their plans will take into consideration your soil, existing plants and other aspects of your lawn. From rocky or uneven terrain to soil erosion concerns, their expertise ensures your backyard is gorgeous for years to come. The transition from interior to exterior should be comfortable for you and guests. Whether you want an outdoor kitchen, swimming pool or even a mini golf course, your professional landscape team will ensure the entire area is aesthetically appealing. In many neighborhoods, practically every home has a swimming pool. If yours doesn’t, it will be more difficult to sell. By having a landscape company develop your backyard, including a swimming pool, you can actually add value to your property. 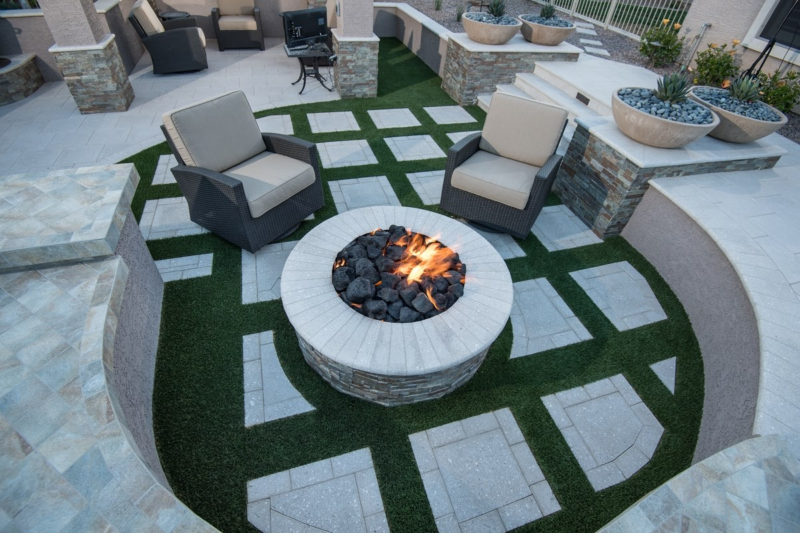 Fountains, fire pits and other amenities are all highly desired in today’s market. Experienced professionals can install these while utilizing local plants and other decor choices for an attractive and valuable home addition. You can save money on your water and electric bills with the right landscaping. Strategically placed trees and shrubs will provide shade during the warmest months of the year. Likewise, a professionally installed irrigation system uses less water to keep your lawn beautiful. Even if you enjoy your neighbors, you need a secluded retreat from the world, including them. Your landscape architects will know the best ways to work with the natural landscape and your desired amenities to create your personal oasis. Most people in the modern world spend too much time indoors. Fresh air and exercise are essential to your physical and mental health. From practicing your backstroke to playing a game on your half-court basketball court, a well-designed backyard will improve your wellness. If you enjoy entertaining guests, then you will certainly appreciate the benefits of having your backyard professionally landscaped. Imagine your guests smiling, whether you are throwing a barbecue, a pool party or some other type of outdoor get-together. Your home is your place of refuge from the world and to entertain those closest to you. Consult with a professional landscape team to start transforming your backyard into the private retreat you’ve earned.